In a follow-up to their previous article published in IFAR Journal (Vol. 15, nos. 3&4), IFAR’s art research director and executive director update the case of John Re, who passed off dozens of counterfeit Pollock and de Kooning paintings bearing a fake “Schulte Collection” provenance. A large group of the fakes were submitted to IFAR’s Art Authentication Research Service. This article reports on the perpetrator’s sentencing and describes the important role that IFAR’s research played in the case against him. 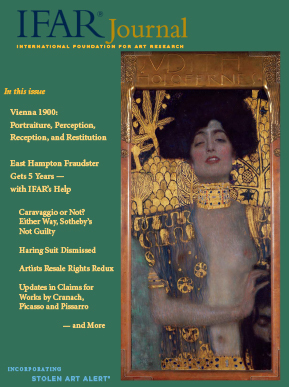 The edited proceedings of an October 2014 IFAR Evening where an art historian, a gallerist, and a Nobel Prize-winning brain scientist spoke about early 20th century Viennese artists and their portraiture; the way that contemporaneous psychology and studies of the brain influenced these artists and their audience; and modern day Holocaust-era art restitution claims involving works by these artists. In a heavily illustrated article, a University Distinguished Professor of Art History and Curator of “Egon Schiele: Portraits” discusses how the zeitgeist influenced the evolution of Viennese portraiture in the early 20th century and provides an overview of the major artists and their subjects – Gustave Klimt, Richard Gerstl, Oskar Kokoschka, Max Oppenheimer, and Egon Schiele. In a discussion illustrated with scientific diagrams, as well as artworks, a Nobel Laureate, brain scientist, and author examines how the new science of mind influenced the Viennese Expressionist painters and their audience, and how it continues to drive the relationships not only between artist and subject but between artist/art and viewer. A gallerist, who is also author of the Egon Schiele catalogue raisonné, draws on personal family history and recent Holocaust-era art restitution cases to trace the exodus of Viennese Expressionist works that were “saved from Europe” during the Nazi era and ended up in major museums and private collections in the U.S. and abroad. A discussion of an unsuccessful British lawsuit against Sotheby’s wherein a consignor sued the auction house for selling his painting as by a “Follower of Caravaggio” that a specialist later authenticated as by Caravaggio himself, although others disagree. The article delves into the state of Caravaggio scholarship as well as the court’s ruling as to the auction house’s duty to its consignor to render a considered opinion regarding attribution. Coverage of a lawsuit brought in a federal district court in New York by owners of a large group of artworks purportedly by Keith Haring against the artist’s eponymous foundation for denying the authenticity of those works. The court rejected the plaintiffs’ anti-trust allegations. They subsequently filed an appeal. Updates on two cases reported on previously in IFAR Journal – Cassirer v. Thyssen-Bornemisza Collection Foundation and Meyer v. University of Oklahoma. In the first story, a California district court dismissed a long-running Holocaust-related claim against a museum in Spain for a Pissarro painting and ruled in favor of the museum. In the second case, a New York district court ordered a Nazi-era ownership claim for a painting in the collection of the University of Oklahoma transferred to a district court in Oklahoma. Meanwhile, the Oklahoma House of Representatives passed a resolution directing provenance research and other procedures leading to the resolution of Nazi-era claims. A summary of the dismissal by a federal district court in New York of a lawsuit brought by the heirs of Paul von Mendelssohn-Bartholdy against the Free State of Bavaria over ownership of Picasso’s Madame Soler, allegedly sold under duress during the Nazi era and now in a museum in Munich. The court rejected the plaintiffs assertions that circumstances at the time of sale allowed the case to go forward in the U.S. under an exception to the Foreign Sovereign Immunities Act. In an update on a case reported on previously in IFAR Journal, the authors discuss the May 2015 decision of the Ninth Circuit Court of Appeals that revived the California Resale Royalties Act (CRRA) while limiting its applicability to California sales. Meanwhile, bills proposing a national resale royalty are introduced in both houses of the U.S. Congress. An update on a case covered extensively in IFAR Journal. The authors discuss a California federal court’s denial of the Norton Simon Museum’s motion to dismiss the claim of Marei von Saher for Cranach’s Adam and Eve. The authors report on a Congressional bill intended to curb illegal trafficking of cultural objects and impose import restrictions on archaeological and ethnographic materials looted from Syria on or after March 15, 2011. Discussion of the Cleveland Museum’s decision to return a statue of Hanuman, the Hindu monkey god, to Cambodia to join several other sculptures found in the U.S. that had been stolen from a Cambodian temple complex and later returned to Cambodia, all of which was covered in the IFAR Journal. Updates to three stories reported on previously in IFAR Journal. Two paintings from the Gurlitt collection – Matisse’s Seated Woman and Liebermann’s Two Riders on a Beach – are returned to their rightful owners. The U.S. and El Salvador extend their Memorandum of Understanding to protect “at risk” cultural heritage of El Salvador. A French criminal court orders Picasso’s former electrician Pierre Le Guennec to surrender a group of Picasso works in his possession. Stolen items include 20 decorative items stolen from the Chinese Museum at the Château de Fontainebleau; Gabriele Münter’s The House, stolen in Nordrheinwestfalen, Germany; two untitled paintings by Jean-Michel Basquiat stolen in New York; Norman Lewis’ Untitled (Study for a Painting), stolen in Newark, NJ. Recovered items include Thomas Francis Dicksee’s Portrait of a Young Woman Called Charmian, stolen in London; a Florentine painter’s Madonna and Child, stolen in Geneva, Switzerland; Pablo Picasso’s La Coiffeuse, stolen from the Centre Georges Pompidou in Paris; Paul Manship’s Central Figure of Day, stolen from a New York gallery. Missing items include Paolo Scheggi’s Intersuperficie curva dal rosso + giallo, missing in transit; Justus Verwer’s View on Pont Rammekens New Middelburg, missing in Maastrich, The Netherlands; a portfolio of Dan Flavin aquatints, missing in Frankfurt, Germany.